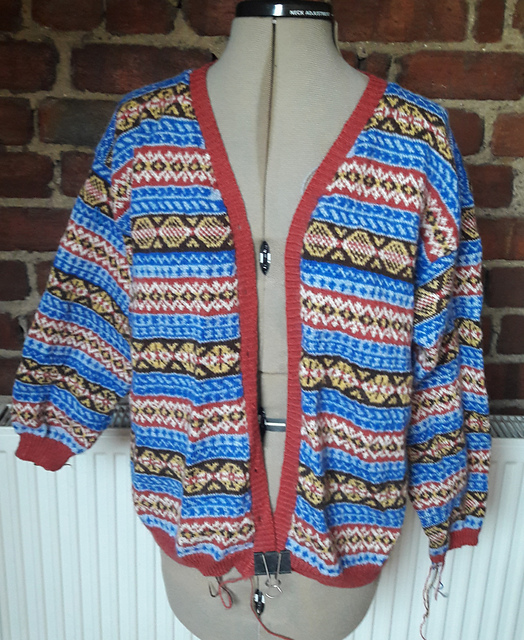 As I start writing this post I’m looking forward a week to the debut of this cardigan at Edinburgh Yarn Fest. 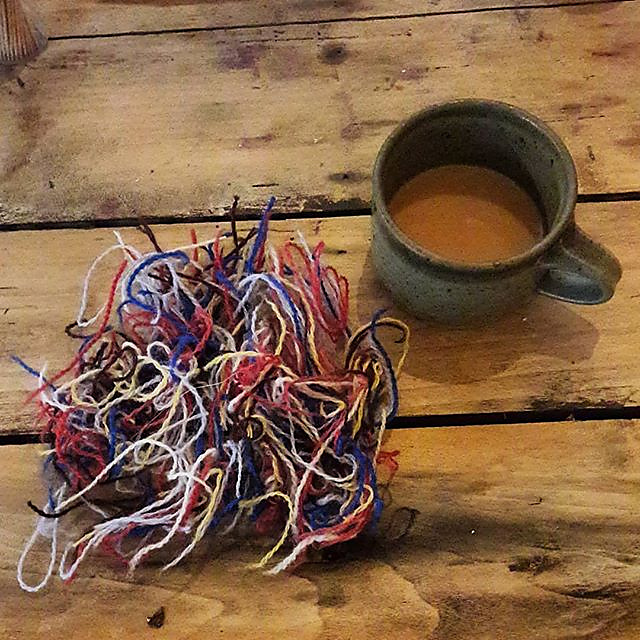 At this time next week I’ll be smack bang in the middle of a demystifying Double Knitting Class with Nathan Taylor -which I’m really looking forward to. Hopefully I’ll be finding double knitting a little more straightforward than I did this cardigan. There were a lot of twists and turns in the genesis of this cardigan but I’ll say right up front – it was worth every one. 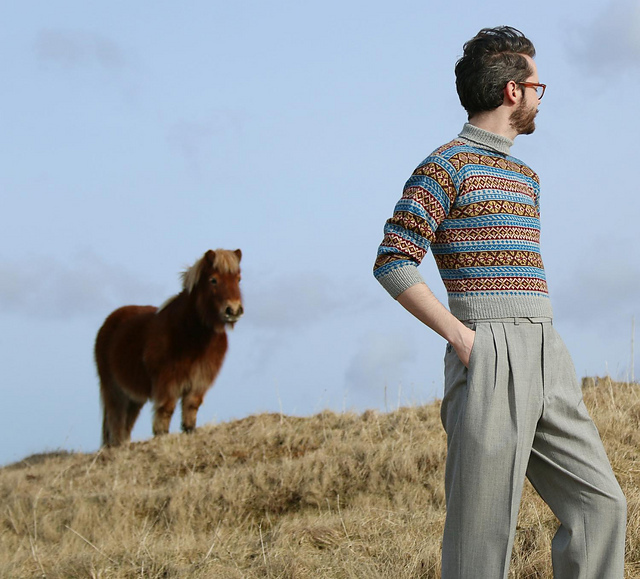 The pattern is from the Vintage Shetland Project, which I’ve mentioned many times before here on the blog, and from which last years’ ‘Edinburgh Cardigan’, Vaila, was knitted. That one was knitted to the pattern, although in a different colourway, and was completed in the early hours of the morning of the first day of the Festival. This cardigan, Yule, was knitted in the original colourway, but that’s about the only thing I didn’t change this time. Well, actually that’s not entirely true, I changed the colour of the ribbed bands to the red because I wanted a stronger contrast to my ‘silver’ hair. The colours of the original Yule were what drew me to this design. The shape, cropped and fitted looks fabulous on Charlie and Denis but was never going to work on my somewhat ‘differently proportioned’ frame. Also, since hot flushes have become an issue I haven’t knitted a jumper, let alone a snug jumper with a polo neck, cardigans that can be easily shed are much more suitable. 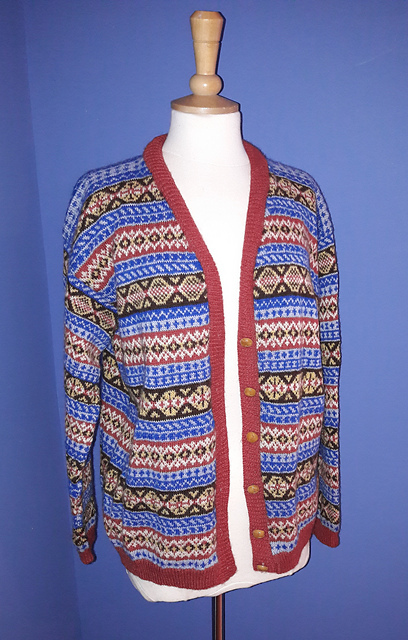 So I decided that the colour scheme and motifs of Yule would look great as a cardigan. Whilst my Vaila, was a little more fitted, I decided to go for a larger chest size for Yule and in doing so found that the associated extra length meant I could just work from the colourwork chart for my chosen size and didn’t need to adjust the length. What that also meant was that I could take the placement (start and frequency) of the neck shaping from Vaila and apply it to Yule marking on the colourwork chart where each decrease needed to be made. So I cast on with my added steek stitches and off I went. 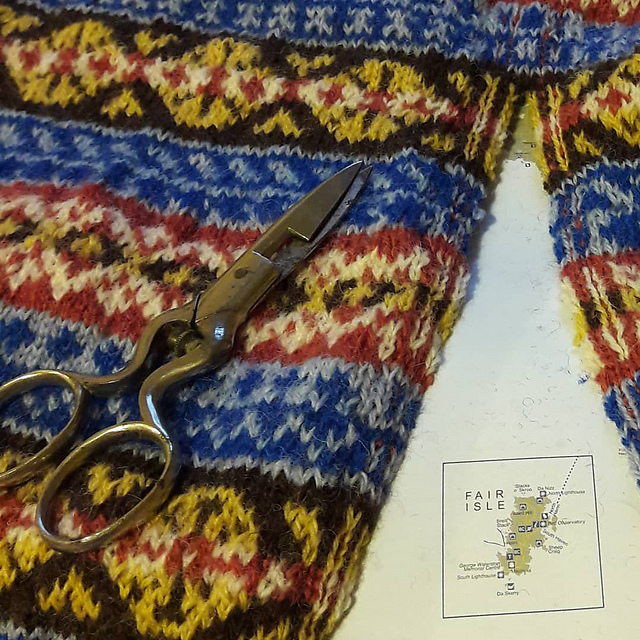 All seemed to be going well and I steeked the armholes, knitted the sleeves and steeked the front whilst in Shetland. I picked up the stitches for the button bands and off I went. Then I tried it on and the sleeves were too short and the button bands too tight. I fixed one sleeve but my heart wasn’t really in it. So it sat in ‘time-out for a while. A couple of things prompted me to get it going again, despite the lack of focus that has confined me to hat knitting of late: the prospect of wearing it to Edinburgh and the Finally Fix It KAL in the heybrownberry & friends group on Ravelry. The group has been really supportive encouraging me along and posting up the picture of my part finished cardy has introduced some accountability too. Measured my gauge at 36sts x 36rows [those colour work rows are a lot deeper than pain stocking stitch rows] which suggested I should pick up 1 st per row. I was almost done on the cast off and started thinking about buttons. Well, actually I thought that i was decided on the buttons but then when I actually fished them out and thought about it, I had second thoughts. My first idea had been the blue buttons, small and neat and fine for a yarn over buttonhole, but when placed along the button band, I wasn’t so sure. Early because if I had thought about it some more, to use the blue buttons the button holes should really have been put in line with the blue colour work bands. Instead I rather liked these wooden buttons or something like them. The only problems was that the button holes were too small for a button of that size. Actually that wasn’t really the only problems. I still wasn’t sure about the button band – it would still need aggressive blocking to sit right. Knit the button band in 1 x 1 twisted rib on 2.5mm needles with 3 stitch buttonholes. This time I left a really long tail when ! finished the cast off in case I needed to redo the cast off. I was trying for the balance between not bag and ruffly and not too tight. I think it has worked. 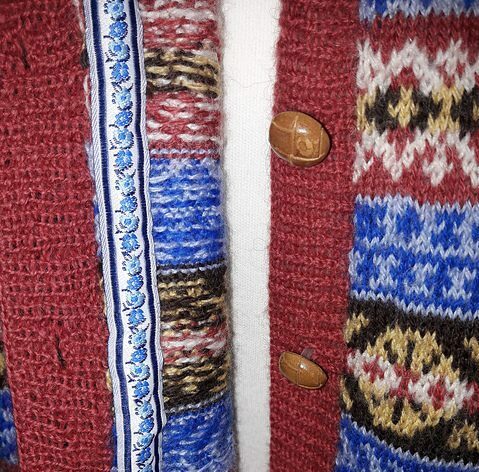 All the garments and accessories in the Vintage Shetland Project have a story to tell Yule is no different. 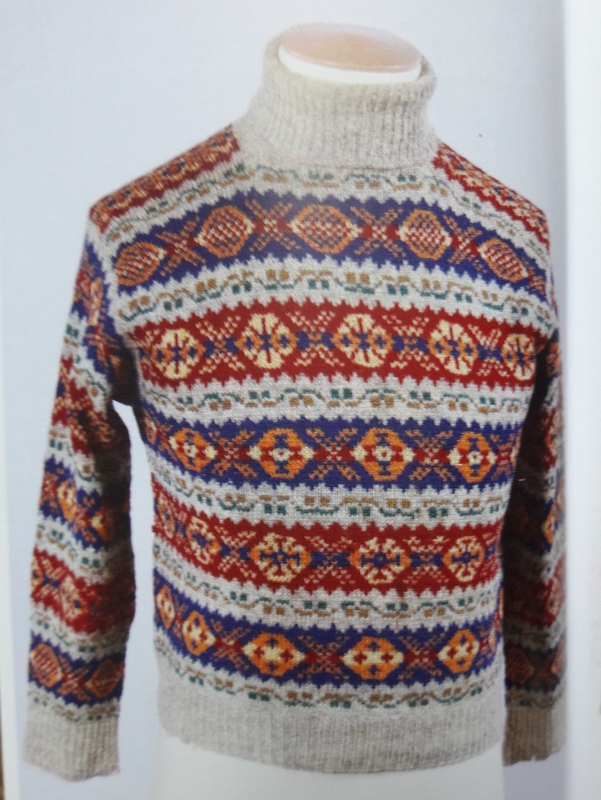 The original Yule sweater was one of 2 knitted for Bob Yule, a young radio operator in Bomber Command in World War 2, by his Aunt Katie. a light grey background with bold motifs in gold and cream against bands of bright red and brown. These strongly contrasting motifs are placed between eye-catching sets of double peeries that use only two colours, the light grey of the background and clear indigo blue. When the first of the pair of peerie motifs is completed, the two colours are reversed, either indigo on grey or grey on indigo. one again Katie makes no attempt to create symmetry: the two sets of peeries in each combination are made more unusual as they are not the reverse of each other. Completely different small repeats have ben used to personalise this jumper even further. The indigo sections of the jumper have faded to a softer blue but are still strong enough to really make the peerie stripes pop. 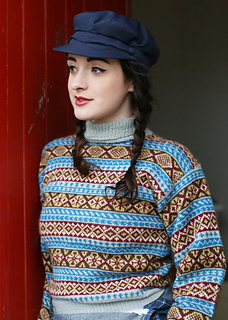 These rows of double peeress are what makes this jumper distinctive and highly original and reveal Katie’s design flair. We know what became of Bob Yule’s sweaters, but what of Bob himself? Bomber Command had an almost 45% mortality rate during World War 2. Bob himself was involved in two crashes, both times when not wearing either of his sweater and after the second of which he never again felt without wearing one or the other of them. With his sweaters to protect him not only from the freezing conditions of plans at this time, Bob survived the war and completed the medical training cut short when he signed up. He practiced initially in his home town of Lerwick on Shetland then moved down to Cumbria before retiring to Bolton le Sands in Lancashire, just a few miles up the road from where both Susan and I live. 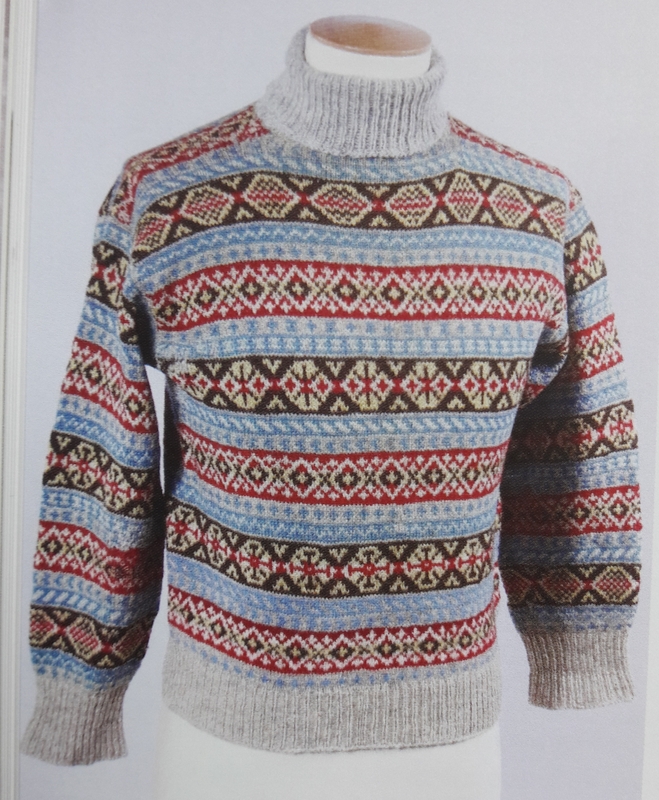 I remember Susan’s frustration with this jumper whilst writing the book; knowing it had a tale but not really being able to track it down. Then series of serendipitous connections led her to Bob’s family just a few miles from her own home and enabled her to fill in the gaps and tell the full story of Katie’s wonderful jumpers. If you join my Ravelry group in which I also plan to be more active in the coming months, complete one of my projects and put up a picture in the Gallery thread, you will be eligible for a randomly drawn prize. The group is still very ‘select’ so it would be nice to see you there.